Ronald Hutton has produced a scholarly work which merits reading from cover to cover. There are some scholarly books that serve best as references for occasional dipping into, but these tend to be turgid tomes written in the excruciating style that characterizes many academics. But Ronald Hutton has produced a well-written book whose style makes for relaxed, if not easy reading, making you want to read from cover to cover. This is the work of a man who has a masterful command of his subject and who can express it in the clarity of those who do not need to be thinking out as they go along. A tome it is, but at no time does it descend into abstruseness. 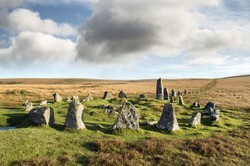 Image above of Down Tor stone circle on Dartmoor. Courtesy of Helen Hotson. Academic books derive their credibility from their authors, but the authors stand or fall on the quality of what they have written. The book is well-written and informative. Hutton, who has appeared on British television as an expert in ancient customs, is a professor of History at Bristol University, specializing in paganism ancient, mediaeval and modern, and this book is the expression of this scholarly expertise gained over many years. He takes you through ancient Palaeolithic paganism up to the modern age when there has been something of a small pagan revival. You cannot discern a position about the truth or otherwise of modern paganism in the book, and he refrains from showing any belief commitments. But he is fair to Christian culture and gives an informed and sensitive account of its relationship with the cultures into which Christianity was introduced. Hutton's command of his subject matter is vast. Every point is supported by reference to archaeological evidence drawn from Britain, about whose archaeology he knows much. There is so much detail that it is hard to grasp it all, so besides being a compelling read this book is one that a scholar of religions or British History would do well to retain it on their shelves as a reference work. At no point does Hutton disappoint, as he at all times writes in a clear style without the verbosity that characterizes many academic tomes. There are no abstruse sections of the book and it is therefore suitable for both the scholarly and general reader. Hutton is careful not to draw premature conclusions from inadequate data, so he never makes a claim that cannot be supported by the data. He fully grasps the limitations of archaeology as a means of establishing what people of the past believed, so whenever there are varying interpretations of data he gives them all. The book is particularly adept at exposing the philosophical and cultural assumptions which archaeologists have brought into their thinking. He notes the way in which imperialist thinking with its superior races conquering simpler natives has distorted the interpretation of British data, and this is especially so with theories of invading Celtic hordes, who did not exist on the scale imagined by Victorian imperialist scholars, and invading Saxons, for whose invasions he presents pros and cons without concluding one way or another. He enlightens us as to the wide variety of burial practices among ancient Britons, and how burial customs seem to differ according to tribal areas. Thus the text is a useful antidote to excessive simplification which sees countrywide cultures where they did not exist. It is also an antidote to the arrogant cultural assumption found among some earlier scholars that native Britons were culturally unimaginative and had to be taught new ideas by the Romans. a view that derives from the snobbery of Victorians with a classical education. The book examines the role of the Victorian period in re-imagining paganism, and its account of the evolution of pagan ideas in the nineteenth and twentieth centuries is a good contribution to scholarship. There is much factual material in the book, but Hutton's insights into the question of whether or not paganism survived through the mediaeval period are important. While he does not believe in a surviving pagan cultus, he accepts that pagan ideas and customs persisted. Mediaeval Catholicism he sees as essentially Christian with much pagan cultural inheritance found in its various forms. This is surely correct. Of particular interest is his account of how during the Roman period the Britons seemed to have taken a renewed interest in the forgotten monuments of previous ages and how some Roman sites contain salvaged bronze age implements. This was entirely new to me. If I have a reservation about the work it is that it substantially, though not totally, overlooks Ireland. This may be due to pressures of space in what is a four hundred page volume, not to mention the copious references. But the two isles are culturally connected, and one can throw light upon the other. Another issue is his discussion of the apparent conflict between genetic data, which reveal limited Anglo-Saxon settlement in Britain and linguistic data, which reveal almost no survival of Celtic languages, which would indicate mass Anglo-Saxon settlement at the expense of the Britons. This inconsistency he could have resolved had he considered Oppenheimer's view expounded in The Origins of the British that in Eastern England Welsh/Celtic was not spoken, but that the language there was a Germanic tongue, so the Celtic could not have survived where it was not spoken. This view is based upon Oppenheimer's observation that East and West England were repopulated after the Ice Age by different groups of settlers, so there would have been linguistic differences. He might also have noted that Welsh was spoken across large swathes of Western England until the eighteenth century, evidence of native Celtic survival. I enjoyed reading this book and recommend it to readers interested in pre-history, religion and British culture. High class scholarship on an important subject explained in well-written English is a compelling and impressive contribution to any library. I like that Hutton has done a lot of research and produced facts supported by data. It is so important to put the true picture in front of readers of things that are from a bygone era. His portraying the true picture of Paganism without swaying is what counts.